Ever wondered how fast is your web site as experienced by customers? From different parts of the world? There are some useful tools around to help! I think everyone in e-commerce knows that site speed matters these days (right?). There are various stats around like you can lose ~50% of visitors on mobile if it takes longer than 3 seconds to load. I mean its hard enough to get them to come in the first place – do you really want to lose them before they even start? 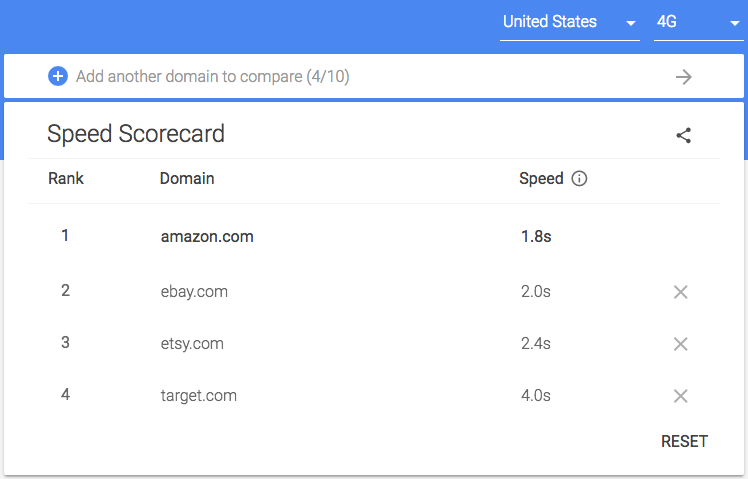 One of the public tools provided by Google is a speed score provided by “Winning on Mobile“. This site is kinda cool because it uses aggregated data collected from real world web browsers. No artificial labs, no artificially high speed networks, this is what Chrome browsers really see (averaged) for different sites. Do you think your site is too slow, but don’t know how to convince management to invest the money to fix it? There are two useful additional features! First, you can type in multiple domain names, and compare your site to others. I picked a few of the big names in this example, but you can imagine putting in your direct competitors. Second, there is a handy calculator to estimate revenue increase by speeding up your site. (No guarantees of course, but convenient to back up your effort to get budget.) Enter the number of site visitors, average order value, and conversion rate, and it will multiply it out for you based on drop off rates. This tells you the revenue gain you can achieve. This of course does not take into account other aspects like brand perception – this is just drop of rates. Is this score perfect? No, of course not. No score is. But it can be a useful tool as part of your overall analysis. And the nice thing is easy to use and understand by anyone, including those who control your budget! ← Google, ECommerce, and Me!